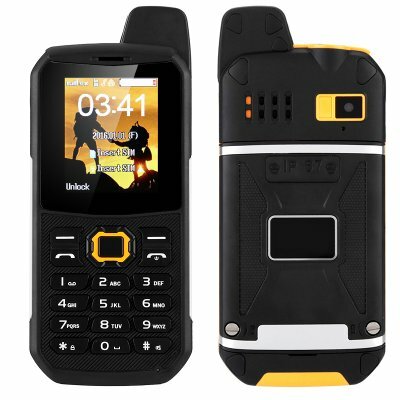 Successfully Added Rugged Outdoor Phone - 3000mAh, Power Bank Mode, Dual-IMEI, IP67, Walkie-Talkie, Camera (Orange) to your Shopping Cart. Head out into the wild with confidence and always stay connected with this fully rugged cell phone. With its IP67 rating, this Chinese phone is protected against water, dust, drops, and low temperatures – allowing you to use it virtually in any environment imaginable. Built to withstand the toughest of situations, this cell phone will follow you where ever you go. Perfect for outdoor enthusiasts who like to enjoy nature while staying connected to loved ones back home – this rugged cell phone will keep you connected no matter where your next adventure will take you. Packing an absolutely mind blowing 3000mAh battery that provides you with 60 hours of continuous usage time, this Chinese cell phone allows you to head out into the wild for days without ever needing to worry about running out of juice. Supporting a power bank feature, this cell phone can additionally use its massive battery to charge other electronics in case of an emergency, ensuring that you’ll always be able to enjoy the beloved features of all your devices even while out in the wild. 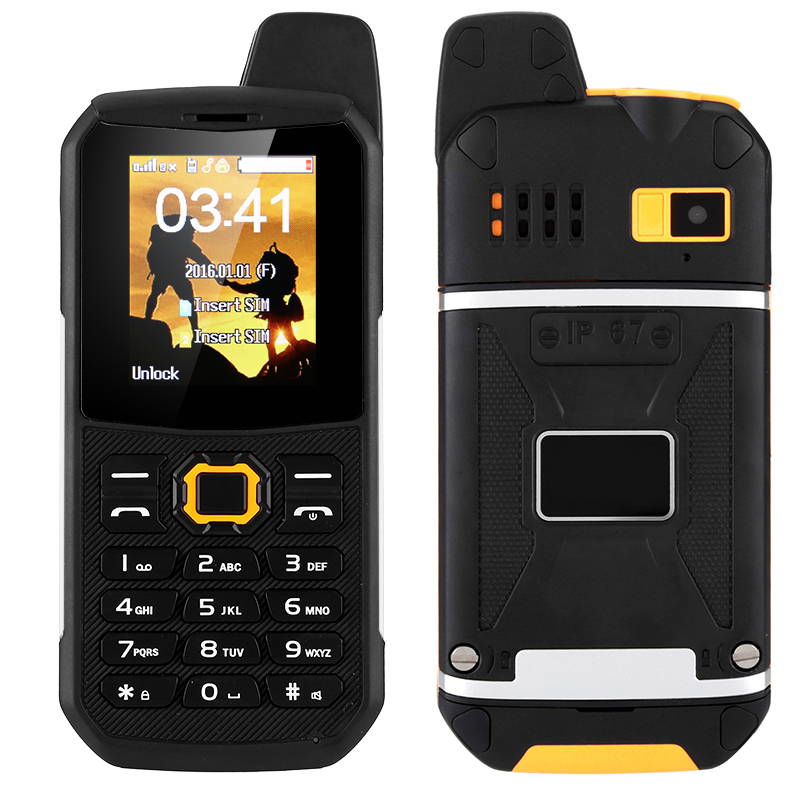 With its Dual-IMEI numbers, this rugged phone allows you to be reachable on two phone number while using just one device. No matter where your next adventure will take you, with this Dual-SIM phone you’ll always be able to throw in a local SIM card while, at the same time, stay connected to friends and family back home with your old and trusted phone number. For those of you who really like to head deep into the unknown, this tough cell phone also features a walkie-talkie mode – letting you stay connected to other outdoor enthusiasts who joined you on your trip even at places where there is no mobile coverage available. Its bright 2.2-Inch display allows you to use the phone even in direct sunlight and its large buttons make this rugged phone easy to operate even while wearing your gloves. To allow you to take even more out of your upcoming adventures, this phone also features a sophisticated 0.3MP rear camera that lets you snap nice pictures during your next outdoor trips. From now on you’ll be able to snap pictures and share the stunning views and exciting moments of your trip with friend and family back home. With 8GB of external memory, you can be assured that there’s always enough storage for you to save all pictures taken during your upcoming holiday. This waterproof rugged phone comes with a 12 months warranty, brought to you by the leader in electronic devices as well as wholesale electronic gadgets..
Arabic: - الهاتف وعرة للماء - Chinese Simplified: - 坚固耐用手机防水 - Czech: - Vodotěsný odolný telefon - Dutch: - Waterdichte robuuste telefoon - French: - Téléphone robuste imperméable à l’eau - German: - Wasserdichte, robuste Telefon - Hebrew: - טלפון מחוספס עמיד למים - Hindi: - पनरोक ऊबड़ फोन - Hungarian: - Vízhatlan, egyenetlen telefon - Italian: - Telefono robusto impermeabile - Japanese: - 防水の頑丈な携帯電話 - Korean: - 견고한 방수 휴대 전화 - Malay: - Telefon lasak kalis air - Norwegian Bokmål: - Vanntett Barsk telefon - Romanian: - Telefon Rugged rezistent la apa - Russian: - Водонепроницаемый прочный телефон - Spanish: - Teléfono resistente impermeable - Thai: - โทรศัพท์กันน้ำทนทาน - Turkish: - Su geçirmez engebeli telefon - Vietnamese: - Chống thấm nước điện thoại gồ ghề -.